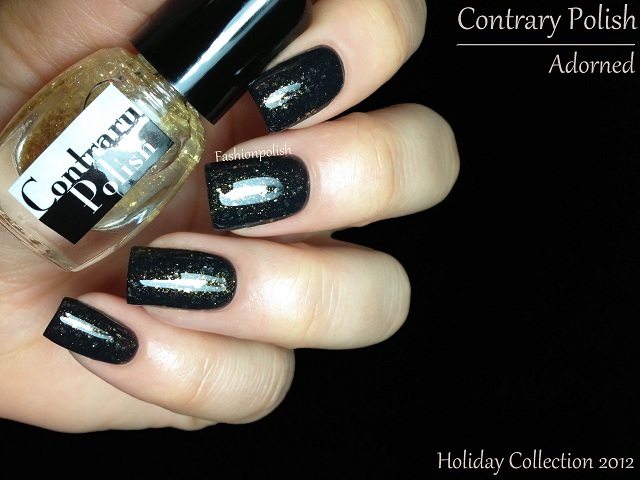 Fashion Polish: Contrary Polish Holiday Collection Review! 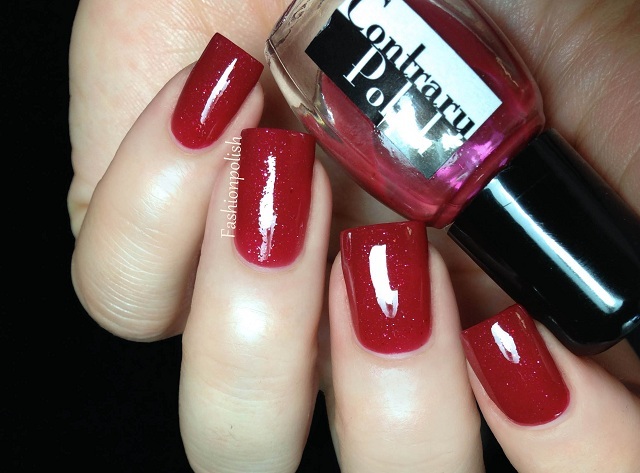 Contrary Polish Holiday Collection Review! 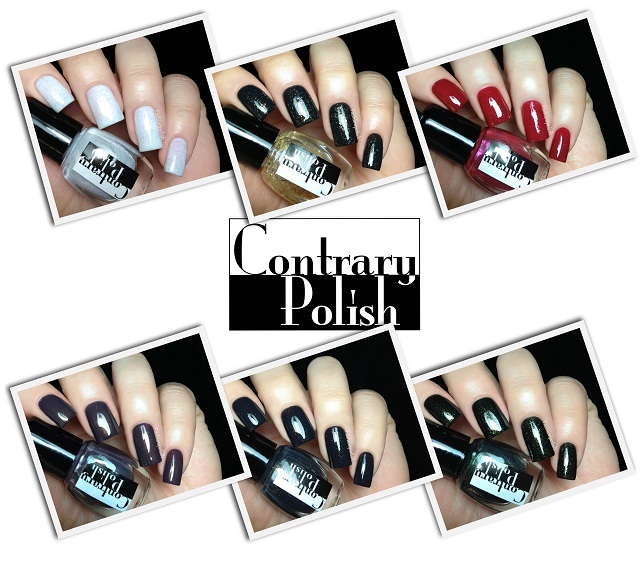 If you're not familiar with Contrary Polish, one thing you should probably know is that it's THE indie brand when it comes to shimmers!I've already reviewed a couple of their polishes last month and today I have the Holiday Collection to share with you. Frozen is a soft white scattered with blue but also green and pink shimmers. It's very delicate and flattering on the nails and I loved wearing it. Formula was surprisingly nice and pigmented. This is two coats plus topcoat. Adorned is a gold topper with different sizes of gold shimmer shreds in a clear base. A very nice alternative to the real gold topcoats released this year if you're looking for a more subtle look. I applied one thin coat over Contrary Polish Candle Light here. Bauble is a muted red with red and silver shimmer. I love red polish and this one's no exception! Formula was great and it applied like a dream in two easy coats. Mystery is a dark taupe with a strong purple hue and a warm brown and gold shimmer. It's just so beautiful! Formula was fanastic and required 2 coats for full opacity. Candle Light is a very dark green based grey with gold, copper and green shimmers. The shimmer is very subtle in real life but it adds a very nice glow. Once again, flawless formula and 2 coats plus topcoat in these swatches. Spruce is a dark green with green and gold shimmer particles. Equally as beautiful as the other Contrary Polish shimmers I've tried! Application was, as expected, easy as a breeze with and the polish perfect in 2 coats. Contrary Polish can be purchased from llarowe.com and retail for $11 each (full size). A few shades are also available in mini size directly from Contrary Polish. For more information, please refer to Contrary Polish or llarowe.com. Great swatches! I just adore Frozen! So beautiful! Mystery is so insanely gorgeous! This is going to be hard. Very hard. If I was a religious person, I'd pray about it. Instead, I'll paint my nails as a distraction. I love contrary polish! I would also own all of them if I could! These are beautiful!! I need Mystery and Candlelight. I have a few of the older Contraries and can attest to their fantastic formula. I will need some of these, starting with Mystery! I just bought a bunch of minis after reading this post - the swatches are GORGEOUS! I purchased Frozen, which is perhaps one of the most beautiful and delicate polishes I have ever seen, and Mystery. I am sad to say Mystery was a bit of a disappointment. It looks much more purple-toned in your swatch, with a coppery shimmer. Mine came out just dark taupe with shimmer. It's still lovely, but not quite what I had expected. T'was a bit of a bummer, to be honest. Anyone else experience this? Would you say Contrary Mystery is a dupe for Chanel Vertigo?